A Quiet Place: Fresh and Genuinely Scary Ride! The movie’s tagline says, “If they hear you, they hunt you.” Well, luckily for us, we do not live in the world of A Quiet Place, or else we will all be hunted! John Krasinski directs a thriller that is so fresh and smart, it might just easily become everybody’s favorite horror film of the year. And yes, I am saying that even if we just entered the second quarter of 2018. In A Quiet Place, we witness the fight for survival of the Abbotts. Lee and Evelyn struggles to make a life for their three kids in the post-apocalyptic world. Set in 2020, the population has been decimated by a group of mysterious aliens who have rather peculiar characteristics: hostile, armored, but blind. What the creatures lacked for vision is compensated by their hyper powerful hearing capabilities. They use this sense to track and kill humans and any creature that make a sound in a predator-prey fashion. With the Abbotts among the few remaining survivors, the film took this opportunity to highlight the relationship among the members of the family. They were a tight one until a tragedy struck them. This incident changed the dynamics and relationship that each of them had for one another. As if the external danger was not enough, the lack of verbal communication blew up the conflict by tenfold. The film employs the most basic trick in horror film creation: the perfect use of noise or the lack thereof. In the fictional world where it was set, people have to maintain silence at all times or else, they will be hunted. The film greatly utilized these elements to create such compelling and nail-biting scenarios. The setting happened mostly in an old house in the middle of a corn farm. Even a bit of movement on the aged hinges and corners of the house can create sounds that will trigger the monsters. It was clear from the get go that the filmmakers know what they want to achieve. That goal is to create a sanctuary for the family but at the same time enclose them in a trap. This juxtaposition proves that the film is concocting something great. Aside from the perfect use of sound, the atmosphere the scenes took place in enhanced the thrill factor. Danger was lurking in every corner and that even an unsuspecting nail can make the audiences’ heart pound. Without drowning the story with the sappiness of a family drama, A Quiet Place still impacted us with parental love. The Abbott parents after all are doing everything they can to secure the safety of their children. Emily Blunt delivered a striking performance as the mother of three children in this apocalyptic world. She had the right mix of vulnerability and aggressiveness. Meanwhile, Krasinski was believable as the father who was trying to maintain a strong foundation for his family. The script provided the main leads with plots that explored their characters even deeper, which in return made them appear more real to the audiences. 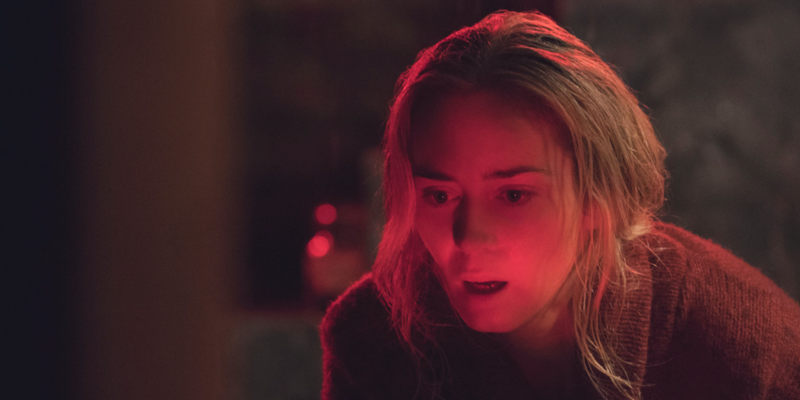 A Quiet Place created a mystery at the start of the film by introducing the aliens. Yet with careful placement of hints throughout the movie, it provided the audiences with necessary information that may answer their questions about the creatures in question. It is now up to them to tie it all up and solve the mystery themselves. With that said, A Quiet Place is one that does not spoonfeed its viewers with exposition and that is a great decision on their part. It is one that requires thinking but not too much that it will take away the opportunity for the audiences to get on the thrilling ride. John Krasinski’s A Quiet Place is a thriller film that does not take itself too seriously yet does not get too playful that it becomes ridiculous nor campy. It is the type of film that plays with the senses and evokes real fear. It is FRESH, SMART, and GENUINELY SCARY! I will dare say this, it is this year’s Get Out! Binge-level: 5 out of 5 stars. PREVIOUS POST Previous post: Here's How You Can Be at the Avengers: Infinity War Event in Singapore!